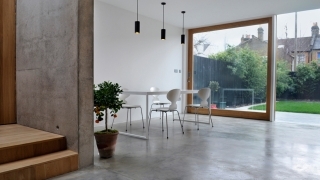 At w+r we specialise in creating hand-trowelled and cast in-situ concrete countertops and worktops. Each w+r countertop is bespoke and tailored to the specifications of each individual client. Pouring in-situ means that countertops can be produced seamlessly without the need for joints. Floor return panels can also be incorporated into the joint free design. The beautiful patina produced by the hand trowelled method is a product of the process that provides a stunning natural aesthtic and is truly unique for each surface.